R2Hop2 Beer & Music Festival: Are You Going? 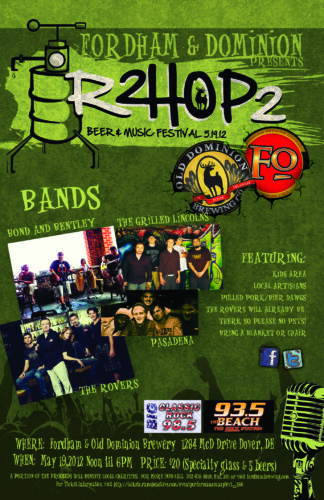 The Fordham and Old Dominion Brewing Company has begun the countdown to R2Hop2, their first beer and music festival, on May 19, 2012. Featuring the live music of four Anne Arundel area bands, Bond and Bentley, Pasadena, the Grilled Lincolns, and The Rovers, this event will appeal to a broad range of audiences. Children under the age of 12 will enjoy free admission and a dedicated kid’s area free of beer distribution and containing face painters, balloon artists, root beer floats, and a fire safety presentation by the Little Creek Fire Department. Likewise, a multitude of local artisans will share their crafts, such as gourmet dog biscuits, purses made out of beer six-pack carriers, and homemade soap. Throughout the day, there will be firkin tappings and special beer releases to entertain the adults. No need to worry about food either, Where Pigs Fly will be providing some of their famous pulled pork sandwiches for purchase and Fordham Bier Dawgs will also be available to hungry attendees. Continuing the brewery’s Year of Giving Back, a portion of the R2Hop2 proceeds will, support the Dover Air Force Base’s Morale, Welfare, and Recreation program. Moreover, the Dover Fraternal Order of the Police will be running a Keg Toss competition and the Shepherd Place homeless shelter will be selling root beer floats. Tickets for R2Hop2 are still available through FordhamBrewing.com and OldDominion.com.